I have seen this Ashley 750 in two internet photo's. I do not unfortunately know the present owner but if you do, please email me. that it has had it's registration recently updated until February 2014. So still very much an existing car and still used on the roads of England and Europe. Please be aware that if the vehicle has recently been relicensed or a SORN declared, these details may not yet be updated on the vehicle record. I'm not sure if this photo was taken at the same meeting as the one above but it could well have been. I say this because I found them at different times and on different websites. Does anyone know the tour badge on the boot, could possibly be 1997 shown on RHS at top? Looks like the owner could be a member of an Austin 7 Club, judging from the surrounding vehicles, which makes good sense as there are not many Ashley Car clubs around (if any). Attached are 4 photo’s I took of 48 NO, looking at all the other A7’s in the background, most probably at one of the 750MC Rally’s at Beaulieu - no idea what year. The PWA7C produced a Golden Anniversary book in 2012, showing members cars. 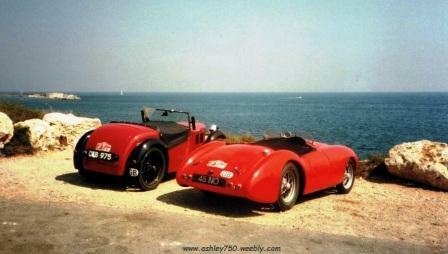 There is another Ashley listed as a “1934 A7 / 1958 Ashley Sports body”. You cannot see the number plate, but the aero screens and mirror make me think it is also 48 NO. I have attached the photo's above and will endeavour to locate and contact the owner from David's information and hopefully find out more about the Ashley. I did manage to contact the owner from David's information by contacting the Pre-War Austin Seven Club (PWA7C), they were kind enough to give me the phone number of the owner so that I could contact him direct. You left a message on my land line regarding my Ashley 48 NO. Unfortunately I was not out in it as it is off the road at the moment. There were plans to have it back on the road by now, hence the DVLA activity recently. I will compile a bit more about the car when I have more time. The above photos with other Austins in were at Beaulieu when I attended in the late 1990's, I think they may be from multiple years. 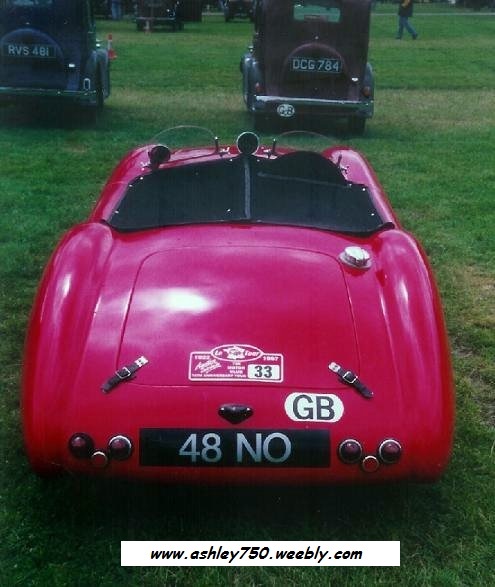 The Rally plate was for the 750 Motor Club Continental run to celebrate the 75th anniversary of the Austin 7 in 1997 which that year was a tour of France down to the Mediterranean and back. I started the 80th anniversary 'Eurotour' to Berlin in 2002 but unfortunately didn't make it all the way having a big end bolt fail in Germany and the car has been off the road since then. 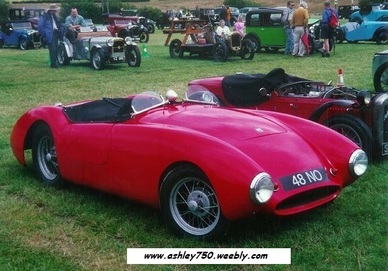 I have another Austin 7, a Type 65 sports model, which I use for most runs these days. However I want to get the Ashley back on the road and I have now all the right ingredients, it is just time which I lack. 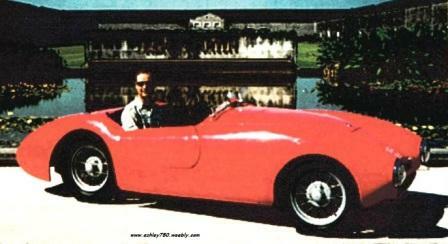 That is me below sat in the car at the Remy Martin Cognac distillery. As I said I will compile a bit more history of the car, I have the buff log book from 1958 and I will let you know how I acquired the car in 1980 and it's subsequent 15 year rebuild! I do know of another Ashley body, in a poor state, which I will let you know the Registration number when I see it next. It might fill a hole in your archives but I must say it is unlikely to be on a chassis again. Well that was all back in June 2014, I will have to chase Iain up and see if he can supply any further updates now that we are 2 years further down the road. As I would like to have more information about the car and make contact with the owner.